Kirsten Hassenfeld’s work is extravagant and detailed. Her forms make reference to luxury, architecture and the decorative art. She draws inspiration from nature, as did the traditional decorative arts, but goes one step further by reuniting processed nature with its origin. Borrowing from the decorative arts, her work becomes excessive and over the top but also alluring in the same moment. Kirsten intends to conceive a fanciful place, creating a yearning for a more splendid existence. Her vision and presentation create a surreal space that allows the viewer to become lost in the reverie. For Bellwether Gallery’s exhibition in the 2006 Armory Show, Kirsten Hassenfeld incorporated work created at Dieu Donné into an extravagant, ornate paper installation. Her experience with papermaking led her to employ the translucency of an over-beaten abaca fiber, allowing light to be projected from within her meticulously constructed installation. 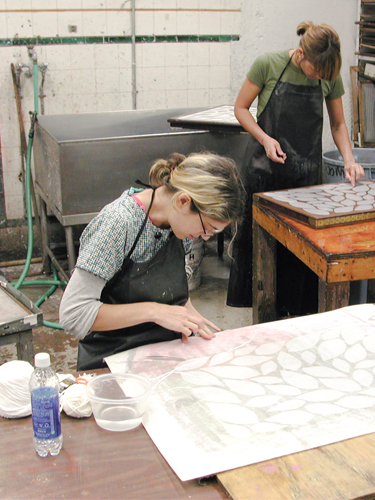 Kirsten created beautiful, translucent abaca leaves by using a shaped deckle to form fifteen abaca leaves at once. She meticulously formed the veins in each leaf by coiling string on top of the abaca leaves, which are then embedded between two abaca sheets as another shaped translucent sheet is directly couched onto them. I think that the loss of control is good for me to be exposed to, and that something can be beautiful in a more “raw” form. I would have never made the collages I made at the end when I first started, but I really like them and I can imagine going more in that improvisational direction. Born in Albany, Kirsten received a BFA in 1994 from Rhode Island School of Design and an MFA in 1998 from University of Arizona, Tucson. She has also studied at the Skowhegan School of Painting and Sculpture.